The automotive industry is undergoing massive structural change, as the advent of new technologies coincides with rapidly changing customer preferences. 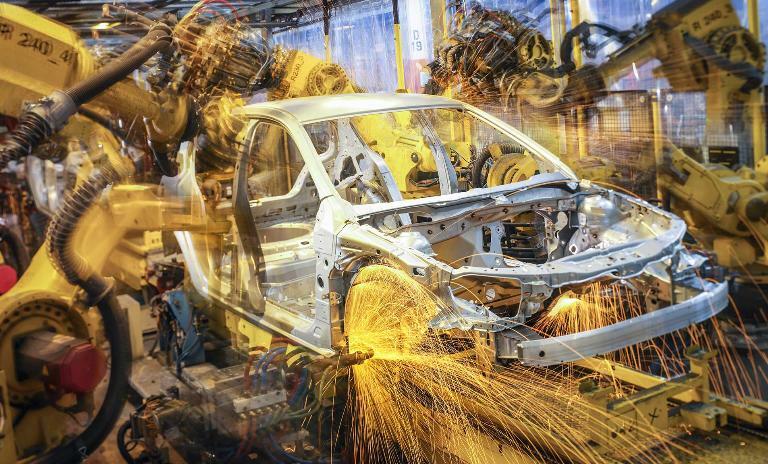 In particular, the inevitable shift from internal combustion engines (ICE) to electric motors is expected to have a disruptive effect on manufacturers. But what do these changes mean at the coalface, for production structures at both manufacturers and suppliers? How can they best prepare for a structured transition? We analyze the impact of the shift to electric motors on automotive production and show some opportunities for vehicle manufacturers and suppliers. OEMs face the challenge of producing both internal combustion engines and electric motors simultaneously. 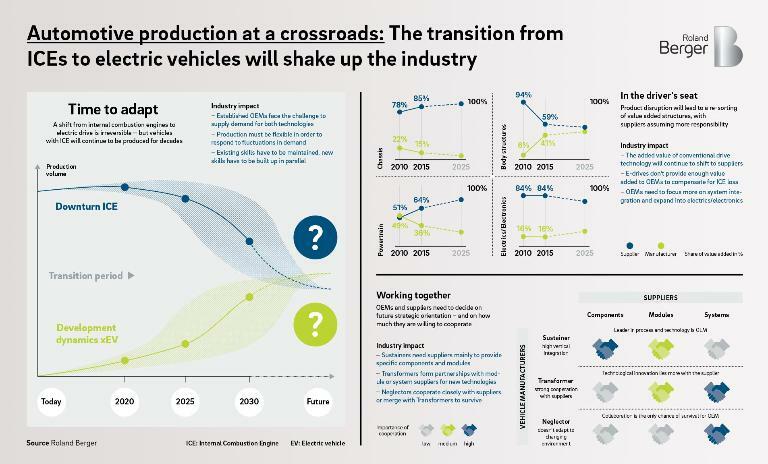 First, the shift to electric drive will have massive implications for automotive production structures, not least because there will be a longer period during which both technologies will be applied. We expect the output of electric vehicles to grow slowly over the next few years and only hit significant volumes around 2022. That in turn means that despite declining overall volumes, ICEs will still be produced in large quantities over the next 12 years and quite likely even after 2030. Accordingly, OEMs face the challenge of supplying demand for both technologies. To do so, they have to become more flexible and more agile – not only with regard to production, but also with regard to employees, who will need to maintain existing skills while simultaneously acquiring new ones. On the flip side, the relatively gradual rise in electric vehicles provides companies with sufficient time to realign production and train staff. Second, the shift to electro-mobility will be accompanied by a re-sorting of the value adding structures in the automotive industry. Relevant e-technology fields have long been occupied by suppliers, which by now have acquired significant know-how. Added value in conventional driving technology will continue to shift to suppliers, too, transferring more responsibility and a bigger part of the automotive value chain to suppliers. For OEMs, this will mean a significant readjustment as e-drives do not provide enough value added to compensate for the loss from ICE. Instead, they will need to focus increasingly on system integration, defining system architecture, software tuning for customization and design-relevant body structures. The decrease in value creation due to changing products as well as increased automation and digitalization in production will indeed shrink employment levels. Third, both OEMs and suppliers need to start preparing for the strategic role they wish to play over the next years. OEMs could position themselves either as sustainers, with a lot of inhouse competence and high vertical integration from innovation to manufacturing, or transformers, marked by high levels of cooperation with suppliers and low vertical integration. While sustainers will remain leaders both in production processes as well as technology, transformers yield much of the innovation to suppliers. OEMs that fail to adapt to the changing environment are considered neglectors and will be likely to lose market share unless they manage a merger with a better prepared manufacturer. Suppliers, on the other hand, will have the opportunity to climb up the added value hierarchy, eventually putting some on an equal footing with OEMs. Their options range from pure component supplier, with a relatively low level of OEM value chain integration, over module supplier, providing complete solutions (e.g. electrical transmissions) mainly for transformers but also sustainers, to system supplier, offering whole systems (e.g. complete powertrain), frequently in strategic partnerships with transformers. Of the three, component suppliers, in particular, will need to strengthen their competitive position through efficiency gains in production. Module suppliers face a more comfortable situation, as long as they manage costs and their modules remain in demand. Systems suppliers, meanwhile, will need to invest heavily in own production structures, while taking responsibility for integration and strategic partnerships with OEMs. Both OEMs and suppliers can benefit from the changes – depending on their willingness to cooperate. The transformation comes just as trends such as digitalization, customization or new mobility concepts offer additional challenges, which will all need to be addressed while simultaneously ensuring traditional production targets such quality or high efficiency are met. Peak performance in individual areas will no longer be sufficient for success – companies need to opt for a holistic approach to transformation, dealing with all relevant aspects. While there is no suggestion companies need to rush, managing the transition in production should start now.